"Why is he delaying El-Sisi? He should have thanked him ahead of everyone else," whispered one middle-aged lady to another at the Coptic Cathedral in Abbassiya, as Pope Tawadros II expressed his gratitude to the statesmen and public figures who had wished "Egyptian Copts" well on the eve of Coptic Christmas. The very instant that the Coptic patriarch uttered first the title, then the name, of the head of the military -- whom the vast majority of Egyptians, certainly Egyptian Christians, credit for having acted ever so promptly to remove president Mohamed Morsi in under three days once the 30 June protests demanded an end to his rule -- worshippers raised their hands to ready for a long and certainly sincere applause. "Oh, God bless him! God bless his life! He is a remarkable, daring man and we all owe him. I cannot even begin to fathom how our lives would have been today had it not been for El-Sisi's intervention; I prayed for him tonight and I asked God to watch over him and grant him strength," said 24-year-old Monica who arrived to the Christmas Mass with a group of friends. Nodding enthusiastically, Monica’s friends -- all in their early 20s -- firmly supported her statements. "Last year we were scared. I am not saying we could not pray or anything like that, because everything went fine on Christmas Eve; but we were scared because it was becoming clear that the president [Morsi] was turning into a dictator who was only going to serve the interests of his group and nobody else's. Muslims were scared and protesting and they were being killed; imagine how we felt then," said her friend Mira. The admiration shared by these girls towards El-Sisi was widely felt by many other Copts who found their way to the Cathedral surrounded by unprecedented security measures. "El-Sisi should be the president of Egypt"; "We are waiting for El-Sisi to announce he is running for the presidential elections"; "El-Sisi could be president and defence minister at the same time"; "El-Sisi should not hesitate to acknowledge the wish of the people for him to be president". 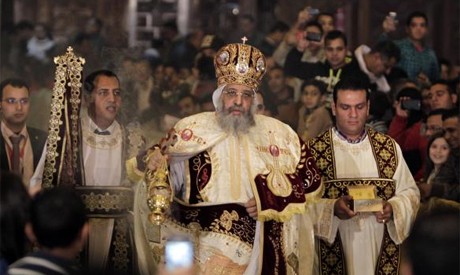 These were some of the prominent statements that joyful – albeit somewhat fearful – worshippers shared with Ahram Online as they entered and exited the Christmas Mass, missed for security concerns not only by El-Sisi but also by the minister of interior, whose name prompted only brief applause – "out of decency, because Pope Tawadros mentioned his name," in the words of Rimon, one of the worshippers. The second loudest applause went to President Adly Mansour, who had called on the Coptic patriarch at the Cathedral yesterday in a rare visit by a head of the Egyptian executive since Gamal Abdel-Nasser had attended in the 1960s the inauguration of the then newly built cathedral with Pope Kyrolos, to wish him a Merry Christmas. Joy over this visit permeated the cathedral. “I think it is a very significant gesture. To be honest, I had not expected it but when it happened I was really very pleased because it goes to show that the president acknowledges his moral responsibility towards all Egyptians irrespective of their faith. It is how things should be, especially after the 30 June and 25 January revolutions,” said 55-year-old Samira, a medical doctor who came to the Christmas Mass accompanied by her daughter Marian and the latter's fiancé Michael. “Why did I clap so hard when Pope Tawadros mentioned the Al-Azhar Grand Imam? Well, I think it is very obvious: if all Muslims were like this great spiritual man, our lives as Copts in this country would be freed of so much of the discrimination that we have been facing for years – since the rule of [Anwar] Sadat [in the 1970s],” said Maher, a retired lawyer. Today, however, “is the time of El-Sisi,” Maher believes. “We need a strong military because we are at war with terrorists who want to break this country down. Amr Moussa could still serve the country, maybe as prime minister with El-Sisi; but we definitely need the military to be at the forefront of the picture,” he said. Most worshippers were not willing – not willing at all – to contrast their admiration for El-Sisi with the day of 9 October 2011 when military vehicles crushed Coptic protesters not far from Tahrir Square during a demonstration decrying the attacks on churches that ensued in the transitional months after Mubarak was forced to step down on 11 February 2011. “I don’t want to recall that day; I think the Muslim Brotherhood must have done something behind the scene to trigger the anger of the army against the demonstrators. Anyway, we are now turning a new page after we all came together again on 30 June  to remove the terrorist Muslim Brotherhood and we should move forward,” said Magdi, a medical doctor in his 40s. Magdi, like many other worshippers, was cautiously hopeful about the future. “Things will be fixed; the important thing is that we got rid of the Muslim Brotherhood who wrecked this country. We now have to vote yes for the constitution that is really granting everyone a better chance; then we will have presidential elections, and I hope El-Sisi runs – if not him, than I hope Moussa will be the president. I believe once we have a constitution and a president, things will start to move in the right track,” he added. In his statement expressing gratitude for those who wished him and the Copts of Egypt a Merry Christmas, Pope Tawadros similarly conveyed his hope that Egypt will move from hardship to prosperity, and that a better and blessed tomorrow is just round the corner.